Are you ready to sell your used motorcycle? Anytime a buyer or a seller gets involved with a used vehicle they face challenges. However, if you follow some simple tips you can make life easier for you as the seller and make it easy for a buyer to make a decision. Selling your bike fast is what it’s all about right? your market. This gets tricky with bikes because they tend to have upgrades and customizations that aren’t going to match up with the base model valuations that you can find on NADAguides.com or kbb.com. Scan local ads on CraigsList or eBay motors plus print ads in local papers and magazines to get a feel for what the competition is asking. Whatever price you settle on, be ready to negotiate a bit. Clean up your bike. Used buyers will be more methodical and skeptical when inspecting a used bike than they will be examining a brand new motorcycle of the same make and model. Getting it clean is an obvious step but you also want to repair any minor scratches and dents. Make sure it’s easy to start and runs smooth. Have maintenance records available for the buyers review. Lastly, have any accessories that you have removed and replaced with upgrades clean and available; they may be the negotiating ticket you need to get your price. Write an ad that gets shoppers contacting you. Online venues like CraigsList will get you in front of a targeted audience and the ads are free and provide plenty of space. Your copy should give a buyer all the info they need to get their interest level to the point they call or text you. This would include the asking price, year, make, model color and mileage. Give a little history like was the bike garage kept, was it only used for touring. Be sure to include brand names and descriptions of any accessories you have added. Pictures…lots of pictures. Every buyer will want to see what the bike looks like so don’t get chintzy with the photos. Post as many as the ad will allow. Get the bike out of the garage and into the sun so colors will show off. Check out photos on bike sites and try to replicate the angles. Make sure you have a clear, easily readable shot of the odometer. Be ready to sell. Have a Bill of Sale, the title and any forms required by your state’s DMV available and filled out with the obvious exception of the buyer’s name, the price and the date of sale. Make buying your motorcycle as easy as possible. 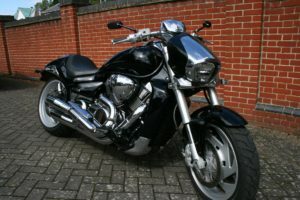 Of course selling your motorcycle yourself means you need to take the time to show the bike, negotiate with potential buyers, ensure the method of payment is secure and completing any paperwork required by your state. You can skip all that and take your bike to a dealer like IQ Auto Buyer who specializes in buying used vehicles. It’s one stop, a quick quote and then a sale. On average dealers who buy used cars can get the process done in less than an hour. Sell your bike yourself or save time with a dealer…the choice is yours.